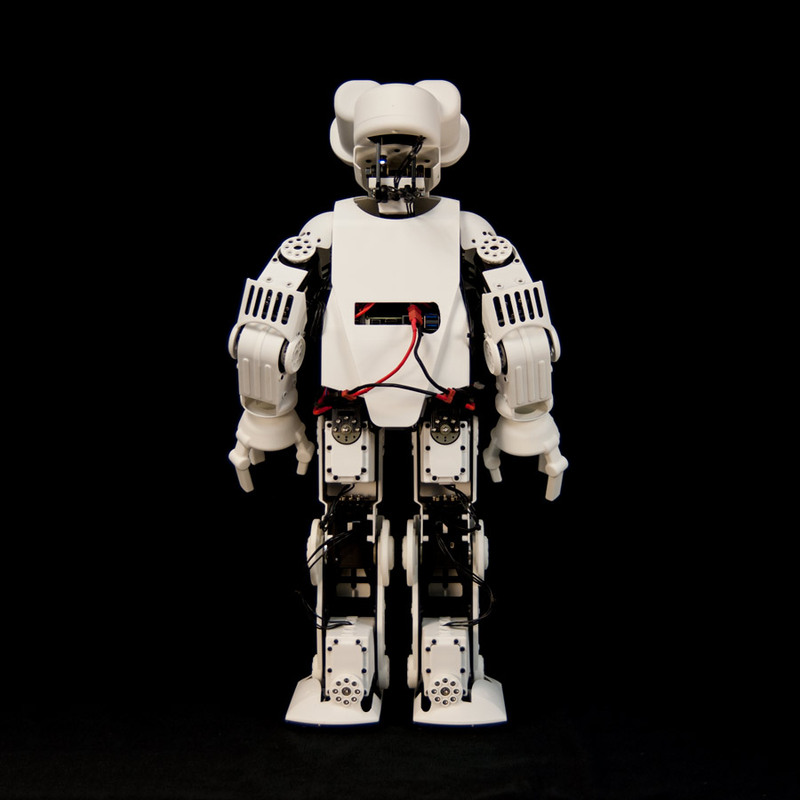 The HR-OS5 Robot is for researchers and educators who are looking for a solid, high-performance, open-source humanoid robot platform to develop on. 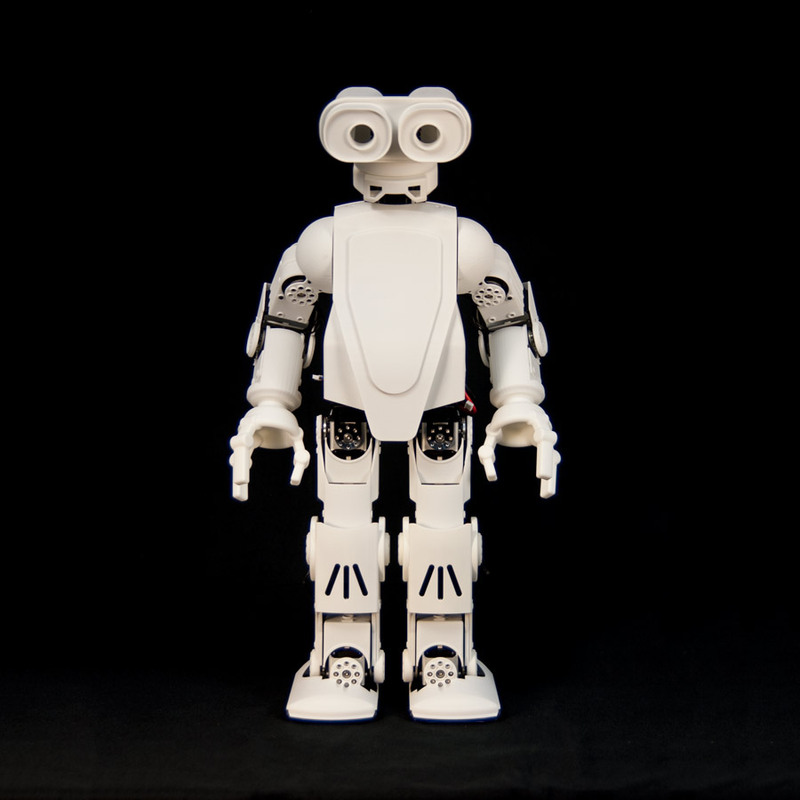 Each HR-OS5 Research Humanoid is assembled and fully tested in-house by our engineers, with a pre-loaded and configured operating system so that developers can dive right in to getting their robot running. 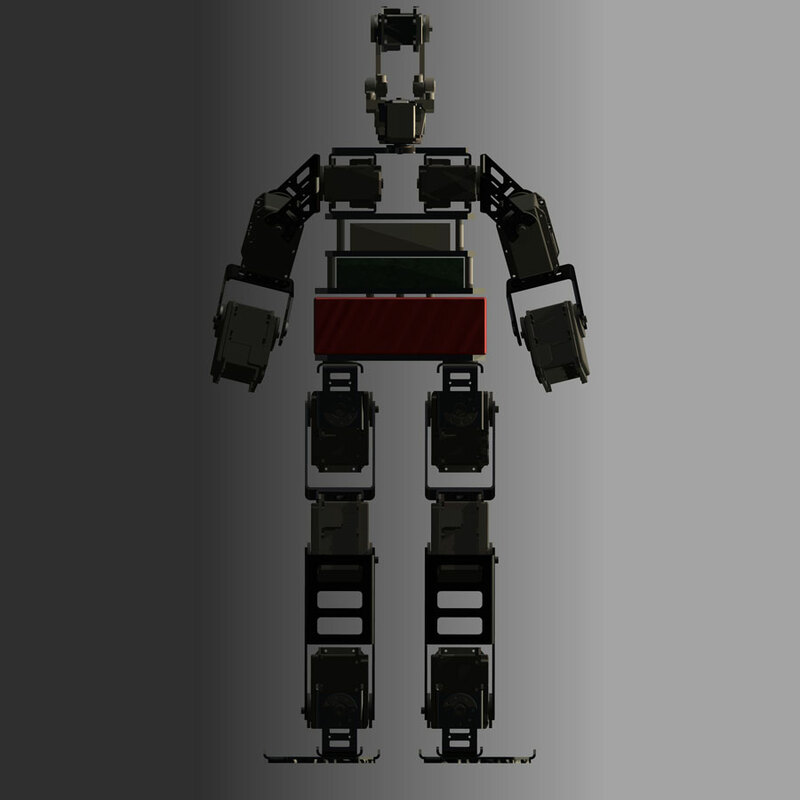 The HR-OS5 Humanoid's internal endoskeleton is manufactured from 5052 aircraft aluminum, and is completely modular and expandable. The outer shell of the robot is designed to be 3D printed, which means modifications and aesthetic tweaks are very easy and affordable. 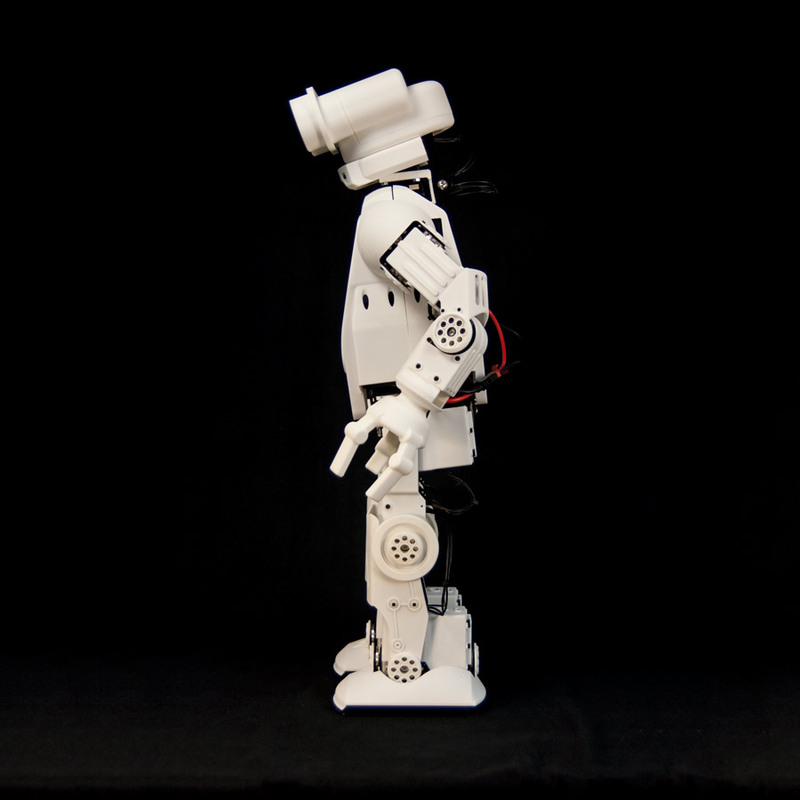 The robot features 12 MX-106T, 6 MX-64T, and 2 MX-28T DYNAMIXEL servos from ROBOTIS. The on-board CPU is comprised of an Intel NUC D54250WYK, which features an Intel Core i5-4250U 4th Generation Haswell chipset, 4GB of DDR3 RAM (up to 16gb expansion), and a 32GB SSD for internal storage. Wireless connectivity options are available in Xbee, Wifi 802.11N, and Bluetooth. Onboard IO for expansion and development include 4x USB 3.0 & 2x USB 2.0 ports, HDMI & Display Port video output, Gigabit Ethernet, SATA port, 2x mini-PCIe slots (used for SSD & Wifi/Bluetooth), and up to 8-channel audio. The sub-controller used to communicate with the Dynamixels is the ROBOTIS CM-730 Cortex-M3 based microcontroller, which will eventually be replaced by our own Arbotix-PRO (currently in development, scheduled release is Q4 2014). Onboard LiPo batteries provide 4S 14.8v 4000mAh of power, which produces approximately 30-60 minutes of runtime per charge. Note: The HR-OS5 is a robotic research development platform aimed at researchers, university programs, and high-level software developers. An advanced working of knowledge of Linux and C++ is recommended to do development on the software framework. We are working to bring a high level API to developers so that the higher level functions of the robot are more easily accessible. In the coming weeks & months, we will be publishing all of our current and available documentation on the platform, as well as continuing to document and develop more information and applications. As this is a very advanced research platform, we encourage potential developers to contact us to answer any questions they may have. We hope to continue to forge an ever expanding relationship with users, developers, and Makers.